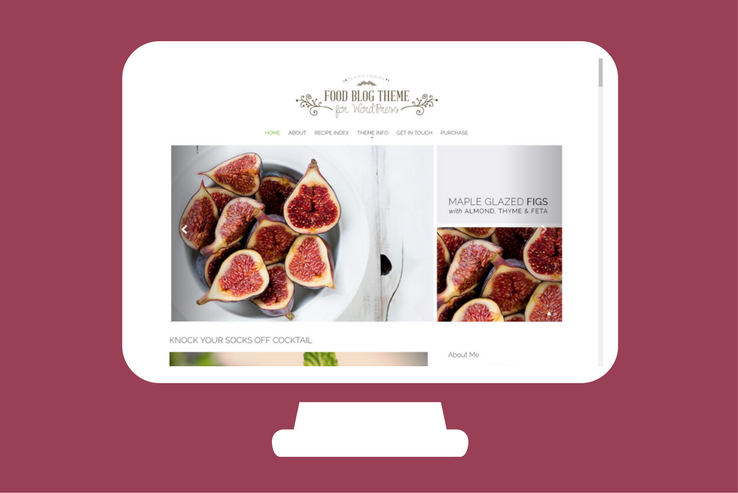 Explore the Food Blog Theme with our User Spotlight! Are you looking for a quality theme to share your love of recipes and your foodie culture with the world? Our Food Blog Theme might be the perfect fit. Display your yummy photos and recipes and personalize your story with this highly customizable content forward theme. Don’t take our word for it. Our community of happy users is growing every day, and we are delighted to showcase three of them today. Explore the story behind their site and how the Food Blog theme has a played a role in their success. I’m Supriya, fearless foodie (I will eat anything at least once), writer, mother to a teen and a military wife. 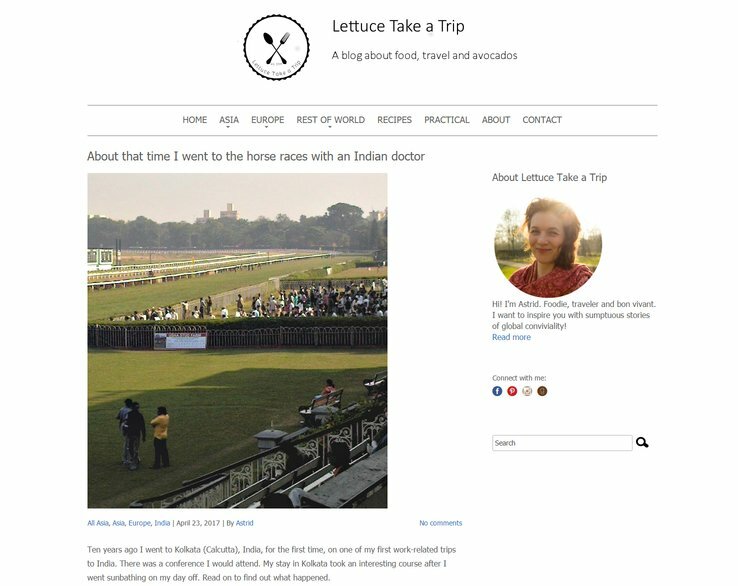 For someone who started cooking at 12 or 13 and chose writing as her profession, I was certainly a latecomer to blogging. Having done it for a couple of years somewhat erratically, I finally took the plunge to getting a self-hosted blog about 2 years ago. It has been quite an adventure cooking and running a blog, with many a blind turn and speed bump. But happily, I’m still clattering away at my keyboard and learning the ropes SEO promotion, food photography, etc. Since my life has been spent in cities across India and a few abroad, my love for different foods and cultures continues to grow and evolve. If someone asked me to name a favorite food, I would be at odds to name a single dish or cuisine; there’s just so much good food in the world! So while my blog is a space to share food stories and recipes that I like to cook, it’s also a kind of journal where I reminisce and ramble about my experiences and reflections – basically, anything that I feel like sharing. Why do you love the Food Blog Theme? I chose the food blog theme for its open layout, which allows a lot of breathing space. This, in turn, helps focus on the food pics. It’s eye-catching! What inspires you in life? I’m inspired by natural beauty. Cliche as it sounds, I’m moved by the changing of seasons, seeds sprouting, buds flowering, the birds, the bees and all that. There is much magic in how it all happens and how fleeting it all is. I’m also inspired by words, poetry, and song. Many a time, what I cook is a result of what I’m feeling at that time. But I’m not a complete daydreamer. The sight and smells of fresh produce, special local ingredients, and eating habits play a big role in the shaping the content of my blog. Needless to say, the work of other bloggers is also a factor. For the last decade, I’ve been working in international publishing, so I travel both for business and privately. People often ask me for recommendations or suggestions if they go somewhere I’ve been, so I thought it would be useful to share my experiences on a blog. Now, if someone asks me for specifics, I can refer to my blog. 🙂 It is also useful as a diary, and I can learn things by maintaining a website myself that I can also apply in my day job, like SEO and fiddling around with code. I love the Food Blog theme since it’s so user-friendly, even for someone who has never set up a website before. I did have some WordPress experience before, but only on the CMS side. I like the clean look I can give my blog, but there’s also a high level of customizations possible. The support is also great! I would certainly recommend it to other aspiring food bloggers! What inspires me is stimulating experiences abroad and at home, like chatting to a random stranger on the ferry or getting to meet new friends on the road. I’m very eager to learn about other cultures, and traveling and connecting with people is an excellent way to broaden my horizon. Food is a bare necessity for everyone all over the world, and what better way to enjoy it than with friends and family, near and far? In business, sharing meals is essential for building a good relationship too, so I always mix business with pleasure. For more ten years I’ve worked in the entertainment industry as a craft service provider. Craft services is the department that provides snacks and beverages to the cast and crew of movies, TV shows, commercials, and videos. Craft service fare, which can consist of everything from sandwiches to hor d’oeuvres, is available the entire workday. However, we generally don’t provide the two main meals of breakfast and lunch. Those meals are handled by the catering department. My original HTML CraftySnax website focused on promoting me and my service. 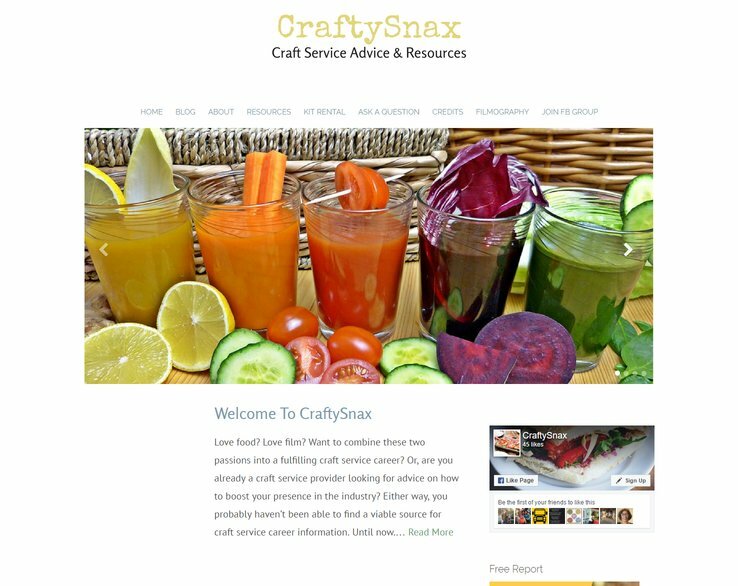 The new WordPress CraftySnax blog using the Nimbus Food Blog Theme is aimed at providing craft service advice and resources to established craft service providers and to those looking to start a career in craft services. 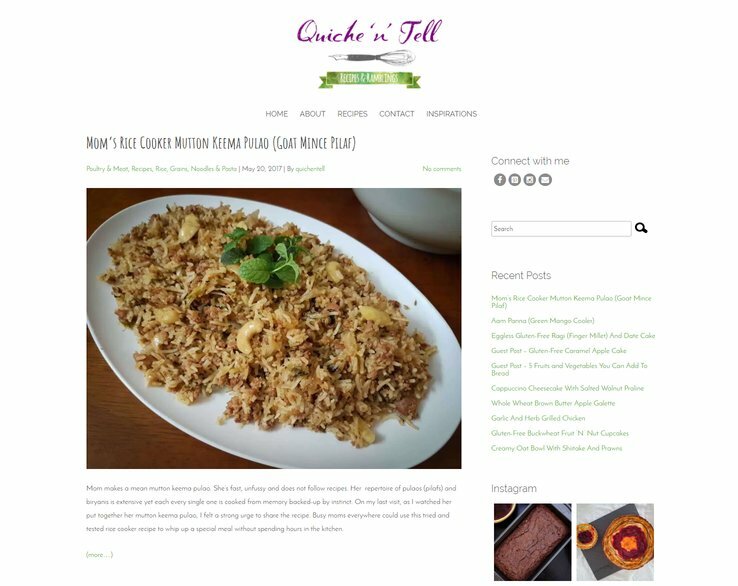 The blog features recipes, shopping tips, budgeting, and much more. The reason I love the Food Blog Theme is because it’s relatively easy to use, allows some customizing, and when I’m stuck, your help desk has provided great assistance. It’s my hope that the website grows into a community of craft service providers willing to share resources and ideas that benefit and inspire all of us to be the best we can in this unique career! Discover for yourself why the Food Blog Theme is the perfect fit for anyone wanting to share their recipes, journey, and experiences with the world. Feel free to share your story with us. This post may contain affiliate links, which means Nimbus Themes may receive compensation if you make a purchase using these links. as a source for WordPress Themes and Resources. Contact Form 7 vs. Ninja Forms: Which Contact Form is The Better Choice? Whether you're a designer, small business, non-profit or entrepreneur, our themes are made for you. Join the Nimbus community today and start crafting the website of your dreams! Find additional contact options on our contact page. Copyright 2013-2019 Nimbus Themes - All Rights Reserved. Nimbus Themes is part of Shea Media, LLC.